For those who have been to the Huajia Yiyuan on Guijie, a favorite both for its excellent food and hutong-style courtyard decor, you might be wary of a newer branch opened in the space-age architectural monstrosity that is Shangdu Soho. Although it lacks the same old-Beijing feel as its flagship branch, this is not necessarily a bad thing; the location is less cramped and crowded, and service is even more responsive. 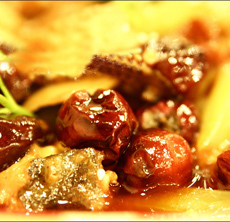 The menu is just as impressive, boasting a huge variety of artfully prepared dishes, from old Beijing and Sichuanese standards to a variety of exotic seafood. Particularly excellent is one trademark cold dish, the Bawang Ji (48 yuan), a heaping cornucopia of chicken and spicy noodles, garnished generously with fresh greens, cucumber, sesame sticks, served on a bed of agar jelly and dressed with a picante sesame sauce. Another favorite is the Baye Yafang (28 yuan), a sort of duck meat spring roll. And though I usually spare myself the trouble of eating Chinese fish, the Tiepa Dayutou (78 yuan) was pleasantly juicy and boneless. The only real disappointment was the Jingwei Nuomijuan (18 yuan), nori rolls with rice so sticky I had to pry my jaw open with chopsticks. Overall, the Shangdu branch offers the same delicious cuisine as its sister stores, and though there's no courtyard seating, it's worth the trip at least to visit the bizarre Soho, which is entertainment in itself. Pilgrimage to Tibet If you want to get a detailed Travel Handbook to Tibet and know more interesting tour routes leading to this divine place. Please click here! Yunnan New Film Project Ten female directors from China! Ten unique sights from mysterious Yunnan Province!Yunnan New Film Project,Travel with the film.Wanna know more? Please click here!